Almost every Indian, particularly Hindu, is well-versed with Ramayana, the epic mythology involving Lord Rama, most popular of the Vishnu avatars, his consort Lady Sita and brother Laxman. Though, Ravana Leela has its roots within the epic Ramayana, this book tells the tale in a very different and refreshing way. If you are expecting to see more of Rama and Sita, then that’s not the case certainly. The book is title Ravana Leela for all the right reasons. 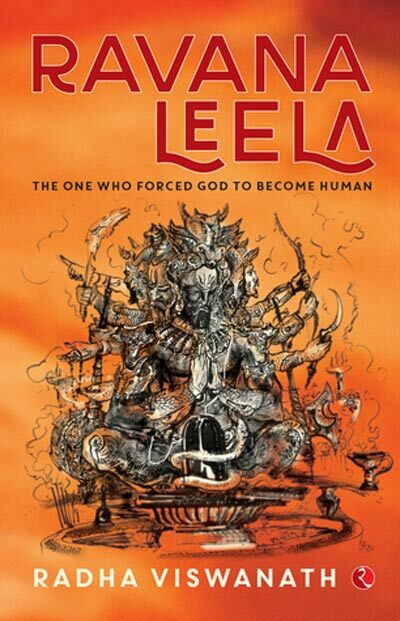 Although, a number of other authors have covered Ramayana from time to time over centuries and millennia, including very recent takes by Anand Neelakantan (Asura – Tale of the Vanquished) and Amish Tripathi (Rama Chandra Series), I found Ravana Leela surprisingly interesting and invigorating. The book explores the background of Ravana’s birth and his rise to glories, followed by his downfall in the end. Being born to a Rakshasi Kaikasi and a Brahmin Vishravasu as part of a conspiracy to overthrow Kubera’s rule in Lanka, Ravana’s existence is definitely a part of a great plot than meet the eyes. Those of you who aren’t familiar with the backstory of Jaya-Vijaya would find yourself a treat reading the book. The storyline has picked tiny tales and events from different texts and versions of Ramayana and stitched them together to prepare a single coherent tale of a legendary Rakshasa. It’s interesting to see how Ravana is given different names through his life and in the end sticks to the commonest of them. I was amazed to see how the author has made use of backstories to put together a very refreshing tale. Coming to the dissection of the book’s various details, the cover is fascinating with a though-provoking sketch of Ravana in his full-form against a subtle background of orange. The blurb interestingly puts the essence of the book in a summarized manner forcing the reader to quickly turn the pages and explore the enthralling tale of the demon king. You will never want to put the book down until you’ve read the last page, that’s for sure. In fact, once the book ended I was seriously wishing that there should have been hundred pages more. We get to explore Ravana’s struggled childhood, his obsession in fulfilling his mother’s wish, his rise to power and, eventually, his corruption. The character building is impeccable. You instantly develop a love-hate relationship with the character. And, that’s not just the case with the central character, but others as well, be it Sumali, Kaikasi, Kumbhakarna, Vibhishana, Mandodari or Surpanakha. Each of them is written so brilliantly that the story tends to flow in a fluent, organized manner around each of them. The plot is great being derived directly from the most popular text in Indian literature. However, author’s ability in picking up minor details and excluding them from those details that are already imprinted in our minds makes the reading experience better. It wouldn’t have done any good if we had read the same old story of Rama, Sita and Laxman. Writing style is excellent with a use of graceful language and sentences, metaphors and though-provoking scene descriptions. Considering how some scenes were graphic like when Ravana plays music to please Lord Shiva, yet, knitted such gracefully that you can actually visualise them without being worried. Author’s vocabulary is superb as well. Storyline’s pace is quick switching between months and years without care. All in all, Ravana Leela by Radha Viswanath is one of the best Indian mythological fantasy books I have read in a while. Totally recommended to people who love a good fantasy book, or are into mythology.